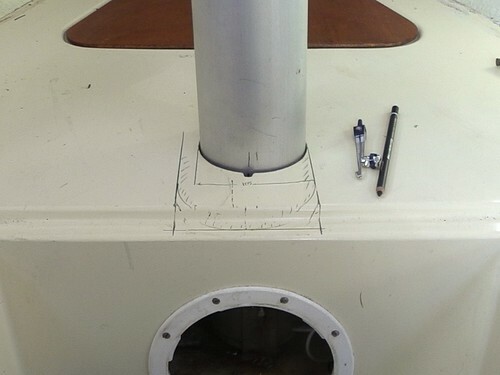 Last week I wrote about my plan to rebuild my mast step. The job is mostly done, and Tammy Norie has a sporty new rake to her mast. This article will describe how I did it, including mistakes and remedies. If you want to know about the design and thought behind it, you should read my post “Raking the Mast”. The total cost is around £40. 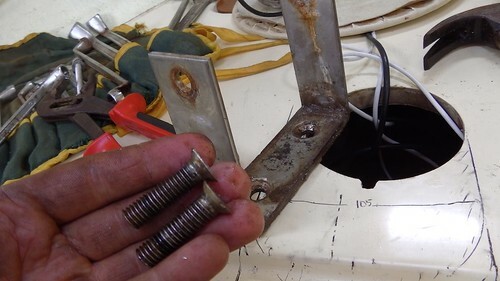 The biggest modification to the boat I needed to make was to cut a larger hole in the berth above the mast step so that I could adjust the angle of the mast. I imagined this would simply mean extending the circular hole into a longer slot. I started out by measuring the area so that I could draw the new hole on the gelcoat. 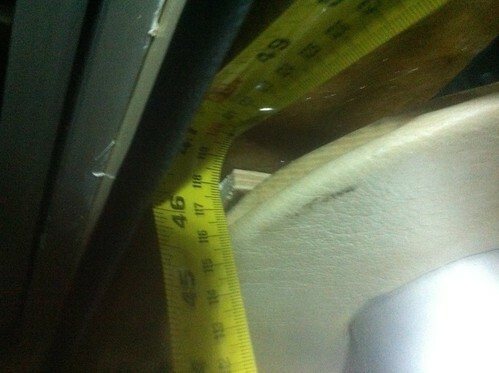 That was when I discovered the first problem: the original hole was not in the middle of the boat! The distance from the left side of the hull to the centre of the mast was 535mm, but from the right side it was only 485mm. 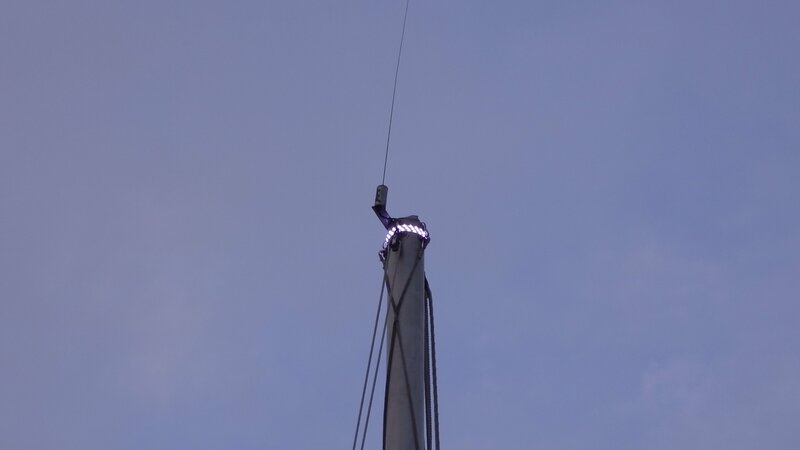 I checked this several times, and looked at the mast from several angles. 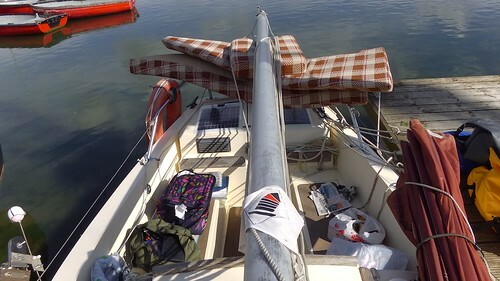 I adjusted the contents of the boat to get her perfectly level, and took at look at the mast from the dock using my spirit level. The mast was definitely leaning to port by a small amount. Oh Newbridge! Well, I suppose I could correct that now. I found and marked the actual centreline from the hull sides, and that allowed me to draw enlarged hole, with enough side-to-side-to-side movement to fix Newbridge’s mistake. The next job was to remove the existing mast step bracket. This is a well-known weak point. Mine had been making ominous clonking noises on my crossing of the North Sea in 2015. It’s a known weakness. What’s more, it had been replaced on every other Coromandel I’d seen. Out with the mast stub! This exposed the bracket, held in with the two largest wood screws I’ve ever seen. I had been wondering how I would get these out. None of my screwdrivers were big enough, and a sailing friend has said I would need some violence to remove them. Fortunately, I was able to borrow an impact driver from Dad’s workshop; a tool specifically designed to apply violence to screws. 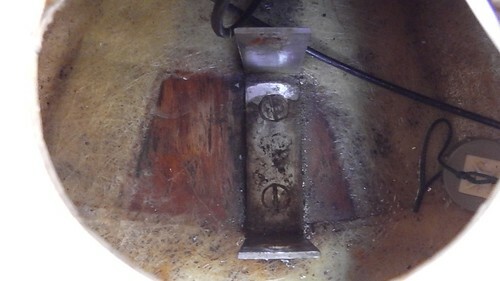 This tool applies a turning force when you hit it with a hammer, making it ideal for freeing up screws that have been in place for 35 years. It worked very well indeed. Out came the screws and the bracket. The observant among you may have noticed that these are not wood screws at all. 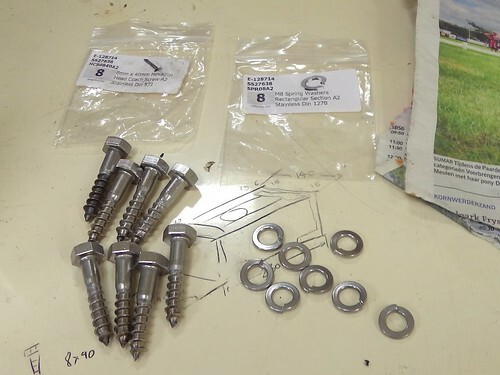 They’re machine screws, designed to fit into nuts or tapped holes. The threads really don’t hold well in wood. Was this more poor engineering from Newbridge, or was there something I’d missed? I took a good look down through the holes in the wood and noticed two things. 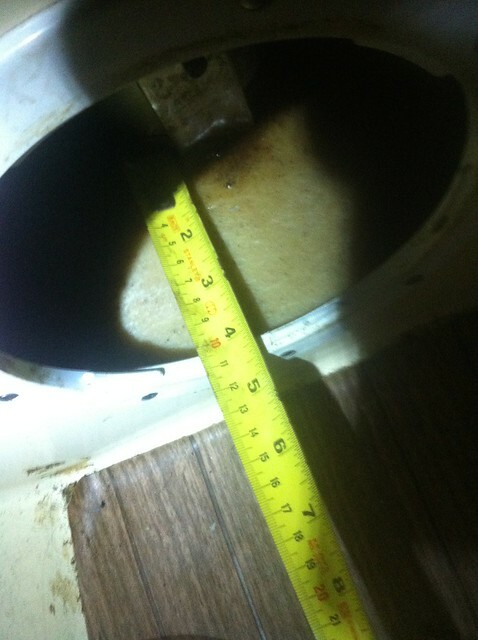 Firstly, the wooden block holding the mast step did not extend all the way down to the bilge as I had expected. There was some sort of void beneath it. Second, there may have been some metal on the other side. Perhaps there was a tapped plate or some captured nuts on the other side. It was very hard to see. Unfortunately, this is yet another area unmaintainable area of the boat. There’s no way to get to the other side of the wood without tearing the boat apart. I made a note to inspect the area with an endoscope during the winter. 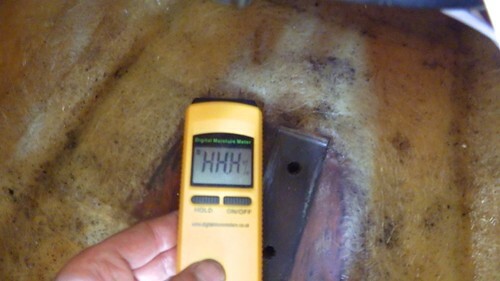 I also checked the moisture content of the wood. It was off the scale on my moisture meter! The plywood the mast is standing on is untreated, as far as I can tell, and has been getting quite wet. I made another note to dry this area thoroughly during the winter and think about how I could treat, seal, and reinforce the wood. 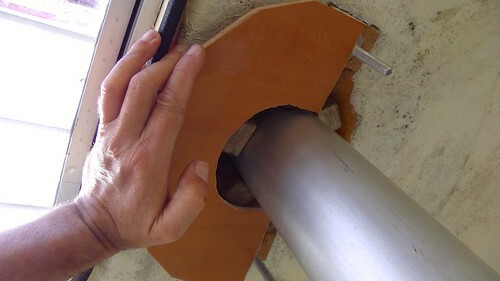 Next, I checked the exact dimensions for the new step by standing the mast step in the aluminium angle. 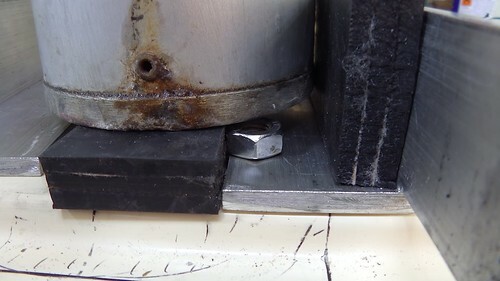 The rubber chocks would be 15mm thick, and I planned to have then compress by about 2mm. 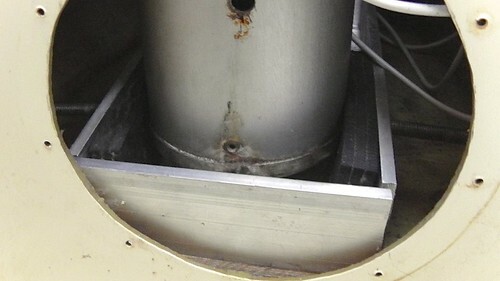 The mast appears to be a 4″ tube, so that made the interior width of the step box 13mm. There followed about an hour of hacksaw work in the workshop at the Fareham Sailing and Motorboat Club. 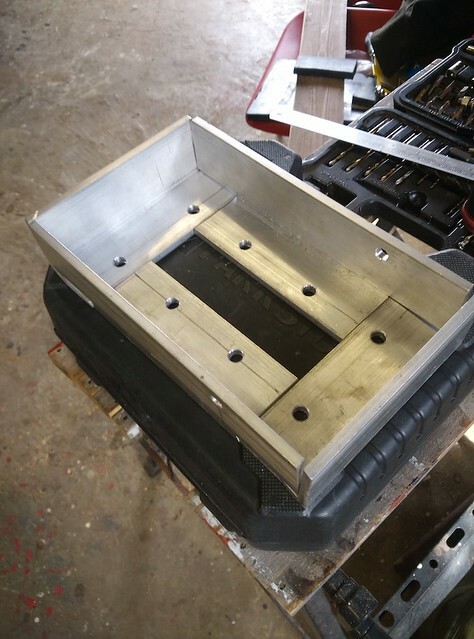 I like to work on projects aboard as much as possible, but this really did need a good bench vice. 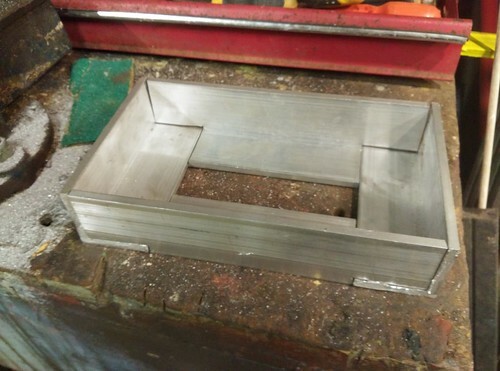 I’m very glad I chose to build in aluminium rather than stainless steel. 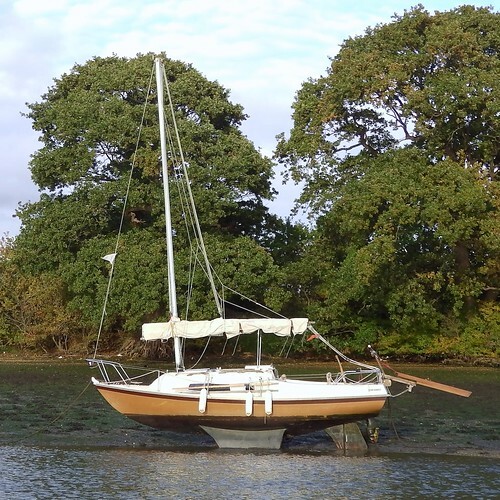 I had enough hacksawing of stainless steel to last a lifetime when I built the Hebridean. (These days John Fleming is offering pre-cut kits!) 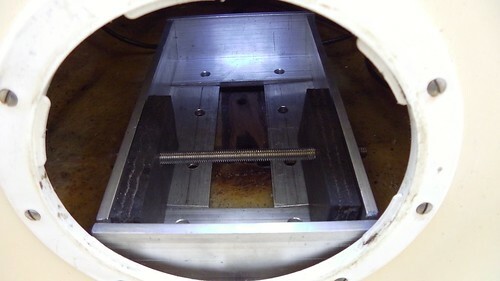 The rubber block was relatively easy to cut with a hacksaw, provided you oiled the blade. 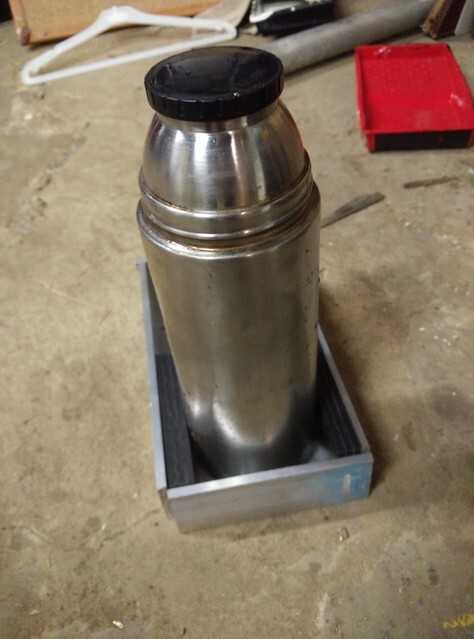 It turns out my beloved tea flask is almost exactly the same size as my mast, so I was able to use it to get a rough idea how things were coming together. The next morning I test fitted the step box around the actual mast. And I checked that the mast would be clear of any screw heads one it was standing on a rubber chock. Next, I drilled holes for the coach screws and the mast pin. I chose positions for the holes about two thirds of the way out, because the mast forces well be attempting to lever up the angles. I also chose too align the holes in the end angles with those in the sides so that the holes are in a rectangle, just in case. I’ve only made one pair of holes for the mast pin so far, with the mast base as far aft as possible. This is so that I can test the mast with forward rake. If I decide to alter the rake I will make more holes. There’s plenty of room for four positions or more. 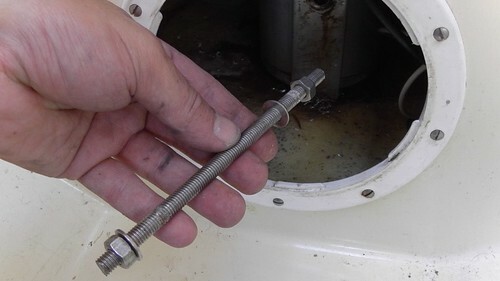 I checked how the mast step box fitted in the boat, but since the coach screws hasn’t arrived the post, that was all for that day. The next morning I had my coach screws from Sea Screw. These are rather special: large screws with threads designed for wood but with hexagonal heads that can be turned with a spanner or socket. The next person to undo them won’t be using an impact driver. So far, no permanent changed had been made to Tammy Norie. It was time to make cuts. 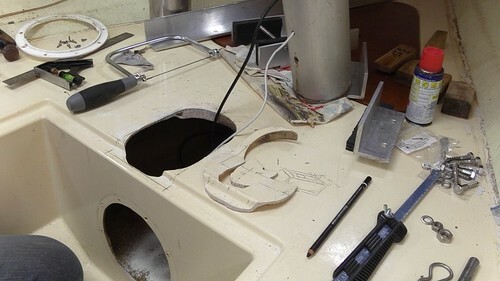 After carefully re-thinking everything, I enlarged the hole in the berth using a coping saw. 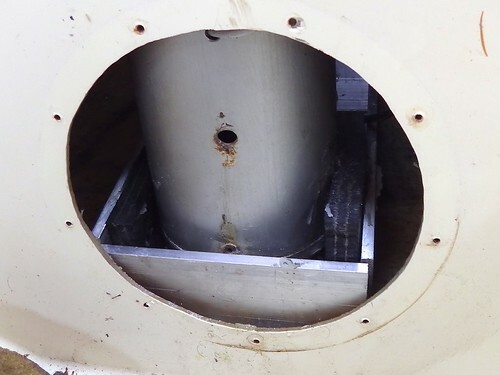 And then I carefully lined up the mast step box, made pilot holes, and screwed it down. I’m eliding a lot of difficulties here. As I suspected, access to the wooden block was very difficult. I wasn’t able to use my battery drill to make pilot holes, and had to fish out my poor-quality hand drill. It was slow going and the pilot holes were not perfectly straight. You can also see that the box isn’t lying flat on the wood. The wood is partly glassed-over and that makes it uneven. These difficulties were enough to mean my careful measurements didn’t with out and the mast wouldn’t really fit between the chocks. Fortunately, the solution is fairly obvious: make a base for the box separately and then fix the whole thing down. Just right! 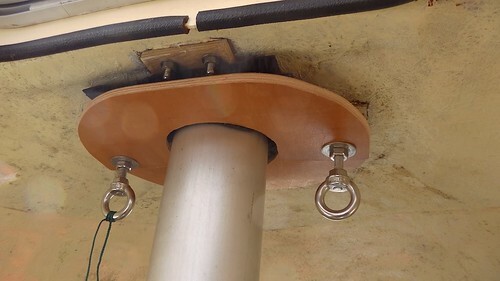 With this change the mast could be pressed firmly down between the chocks, gripped tightly, but with no possibility of abrasion. With this done, I disassembled used a punch through the holes I’d made for the mast pin to mark positions for holes in the mast. These were a bit closer to the mast end than I’d like, and for this reason I’d recommend making a taller box of you’re planning to do something similar — 100mm tall I suggest. I then drilled 6mm holes in the mast for the pin, and tried to put everything back together. For about an hour. 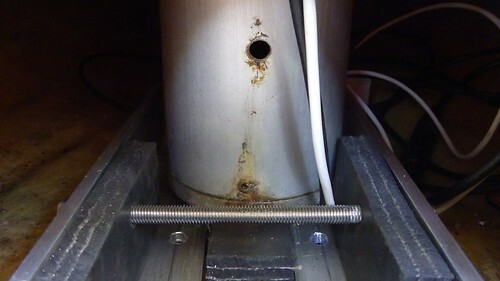 The thing is, it’s very difficult to navigate a piece of threaded stainless steel studding through six not-quite-lined-up holes when two of them are made of rubber and all of them are in an awkward place you can barely see. After a while I disassembled the whole thing again and enlarged the holes in the rubber using a 10mm drill bit. The holes still ended up much smaller than 10mm, but at least the studding went through them without force. 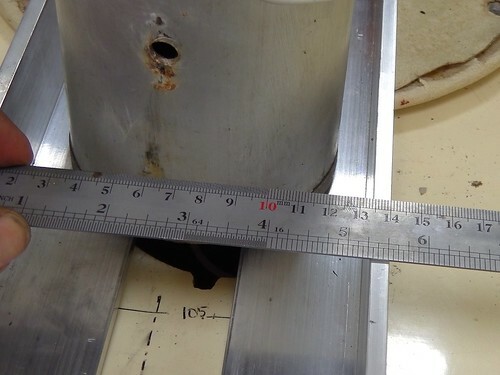 I also enlarged the holes in the mast to 8.5mm so that I had a hope of finding them. It still to another 30 minutes of fiddling to get the pin through, and I was very relieved when it popped out of the other side of the box. After that I was very reluctant to disassemble the step again! 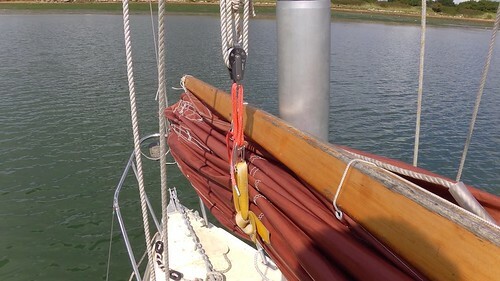 I think this could be made much easier by fitting a tube through the mast to guide the pin. I may do this later. I certainly recommend it to anyone making a step like mine. You might notice that there are no chocks fore and aft of the mast. I’ll be making these soon. In order to maximise the forward rake of the mast I did not leave enough clearance for a 15mm chock. I’ve ordered thinner rubber for this job. 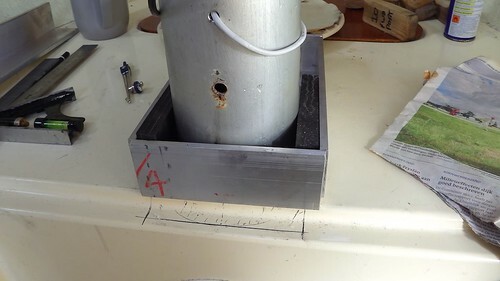 I believe the step is already significantly stronger than the Newbridge bracket, and I can make tests of the mast position without these chocks. But for the long term I wasn’t to make sure that the pin isn’t taking any load. Fortunately, I found that I was able to re-arrange my existing mast partner wedges to fit around the mast in its new position. They aren’t a great fit, and I plan to make more, but for testing these are good enough. The next snag was that the disc that helps keep the wedges in place no longer fitted over it’s bolts! This was a fairly obvious mistake on my part. 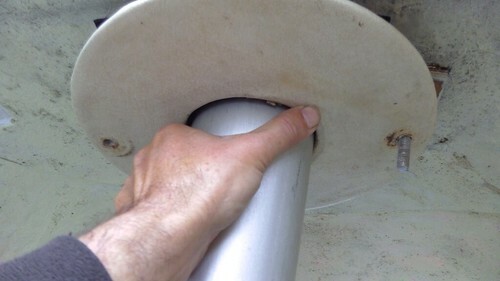 The new mast angle has shifted this disc back slightly. The remember this disc puzzling me when I first got Tammy Norie. 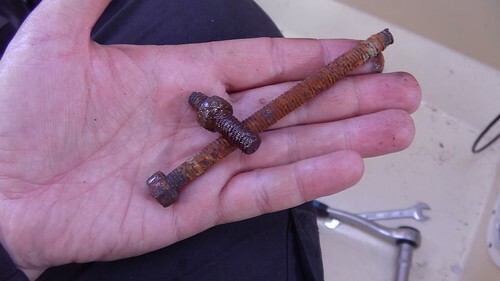 It’s made of heavy gauge stainless steel and is probably one of the strongest items on the boat, and yet it’s only job is to keep the wedges from falling out. No other Coromandel owner has such a heavy one, so I suspect this is a modification by the original owners. 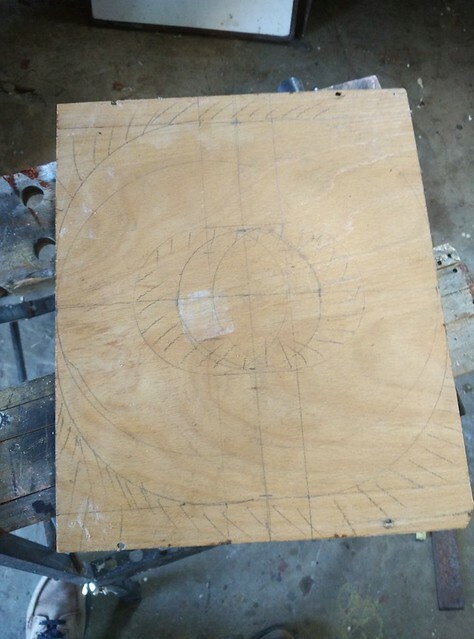 Fortunately, there was some ideal scrap plywood in the workshop — the seat of some school chairs. 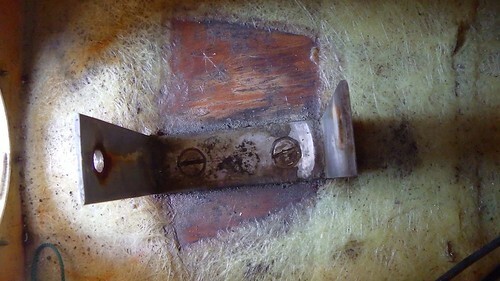 This wood had been moulded for sitting on, and so had a nice circular depression in the middle. Turned upside-down that depression will press upwards against the wedges. Rather than make a complete disc I decided to make two half-discs with an overlap. And instead of bolt holes I would make slots. This would make the new disc capable of being added or removed without removing the mast, and able to cope with mast rake changes. I marked up the wood. Then I put the coping saw to use again. Checked the positions of the bolts. Cut slots and then smoothed everything in to shape with my surform. Finally, I was able to put the interior back together and make Tammy more like home again. There are still a few problems to solve, as you can see here. Finally, here’s the best picture I have showing the new mast rake. I think it looks rather interesting and attractive. So far I have not had a chance to test the new sailing characteristics. Soon, I hope. There are more pictures with descriptions in this Flickr album, showing the steps in more detail. 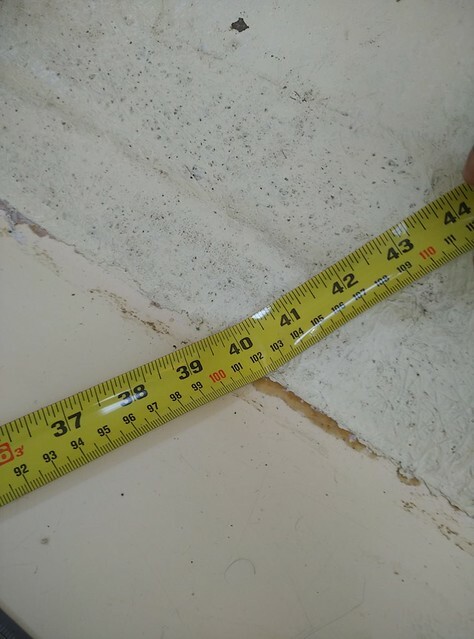 Here’s a roundup of small jobs done on Tammy Norie in late August and early September. When comparing Tammy Norie and Emmelène, I suggested we drop Tammy’s mast and lift the mast stub. When we went to remove the retaining bolt, it snapped! I cut a new bolt from stainless steel studding. I suspect the wear on the bolt was the main cause of the clonking sound that’s been gradually building up when Tammy is in rough water. 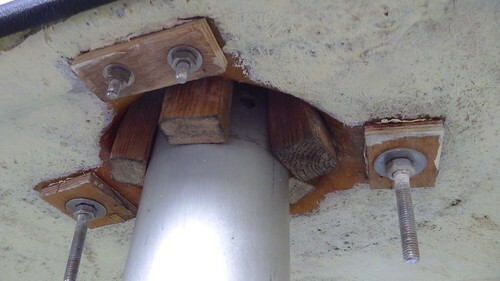 This also gave us a good chance to look at the rather inadequate mast foot bracket. This is due for an upgrade later when I improve the mast step. My engine starter cord snapped at an inconvenient moment on the way in to Portsmouth Harbor. I’d only just replaced it. This time I noticed that the cord was slightly melted. Moral: don’t use melty synthetic string for your engine starter. 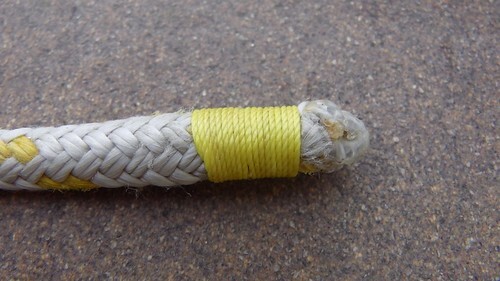 Use cord specifically designed for the job. Replaced the incandescent bulb in my trusty utility lamp with a domestic halogen-replacement LED that I just happened to have knocking around. Half the power and a great deal brighter — possibly too bright. 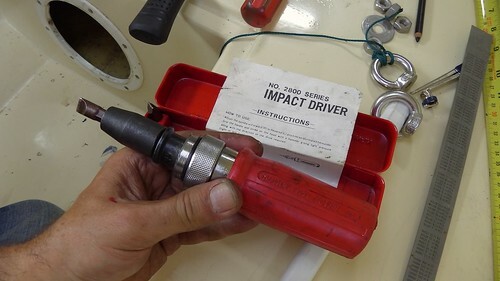 Replaced the coaxial connectors on my log and depth instrument. They were being to corrode and the log was unreliable. I had to dismantle the instrument and desolder the old connectors from the circuit board. I bought a pack of 10 replacement connectors from eBay so that should keep me going. NASA Marine were very helpful. I am finding my new Iroda SolderPro 70 butane soldering iron very useful. While I was doing that I fixed another problem with the instrument: it’s too bright at night. 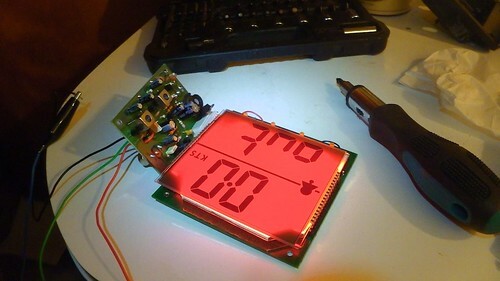 I couldn’t find a way to do this electronically, but I discovered that the backlight and the display are physically separate. I cut a piece of paper to slip between them and the display is much less dazzling. The charts in my Solent chart pack were getting dog-eared, so I’ve edged them all with Scotch Magic tape, which is nearly invisible and takes pencil marks. The bow light hack finally failed after two years. The LED replacement bulb fell apart somewhere inside so that the terminals no longer connect. This is probably because it was not designed to be shaken about on the bow of a small boat. I ordered a couple of made-for-purpose replacements, one of which is now in the bow. The other is a spare for either bow or stern. My mast lift is now a spare halyard. The mast lift is a loop holds the forward part of the sail bundle when the sail is reefed or lowered. Practical Junk Rig (fig. 3.49) has it as a single line from the mast head. I may re-rig it a shown in Practical Junk Rig figure 3.50b, using the spare halyard on one side, allowing me to reef upwards! I whipped some rope ends! I rewired my switch panel using some new terminal blocks and rules: each piece of equipment goes to its own terminal, then switches are wired to terminals using colour-coded jumpers. Much neater, and a model for how I’ll do things when I remake the panel. Expect more small jobs next month. 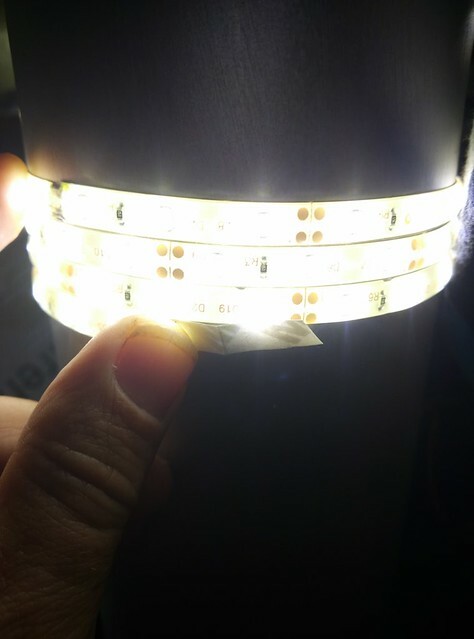 The YBW forum thread “LED’s in navigation lights will change their color” has some good technical discussion of how installing “white” LEDs (which are not all the same) can affect navigation lights. 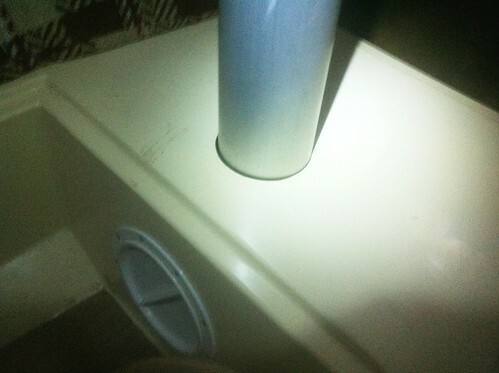 You might recall that I’ve installed LEDs in my lights, but I was careful to use a “warm” white LED at the bow. Anyway, I posted about my plans for mast lights on Tammy Norie, and I thought I’d share my ideas here. I’ve been without fixed interior lighting in Tammy Norie for a long time. Last year, I bought some cheap waterproof LED lighting strip to experiment with. The main problem with it is that the individual LEDs are so bright that they leave afterimages in your eyes. 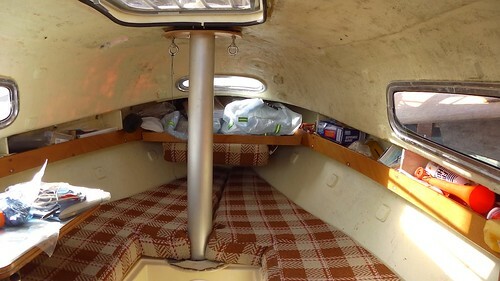 I ended up tucking the strip into the shelves around the boat so that I couldn’t see it directly. This isn’t a permanent solution, but it’s quite handy for now. 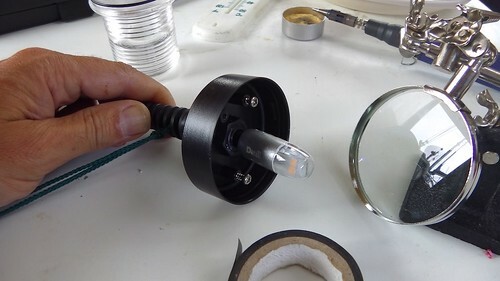 Then I remembered NASA Marine’s “Supernova” masthead lights, which consist of an array of individual LEDs arranged in a circle, and I wondered about wrapping a strip of LEDs around my mast to create an all-round light. 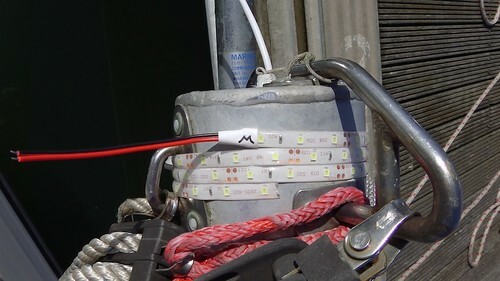 This seems like a very easy and cheap thing to rig, and an improvement on my dangly utility light when I’m at anchor or under power. But what about other masthead lights? 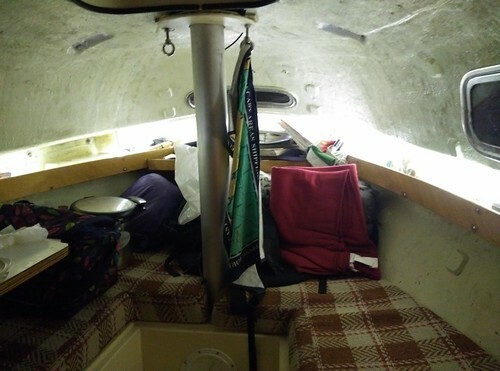 Well, Tammy Norie has deck-level running lights: a red/green bicolour at the bow and a white stern light. I don’t intend to change that. I’ve read two separate complaints by ship captains about tricolour lights being hard to see — especially sharp modern LED lights. I believe tricolour lights exist not to improve visibility, but to save power by having a single incandenscent bulb for the red, green, and white sectors. [Edit: See the comment section for a refutation of this by Annie Hill.] With LED lights using a tenth of the power of incandescents that’s no longer an issue. I think I’ve only ever seen this once, on a square-rigged tall ship. There are some nice clear illustrations of this combination at boatcourse.com. You can see in this picture that there’s quite a lot of clear mast space between the yard hauling parrel and the masthead. 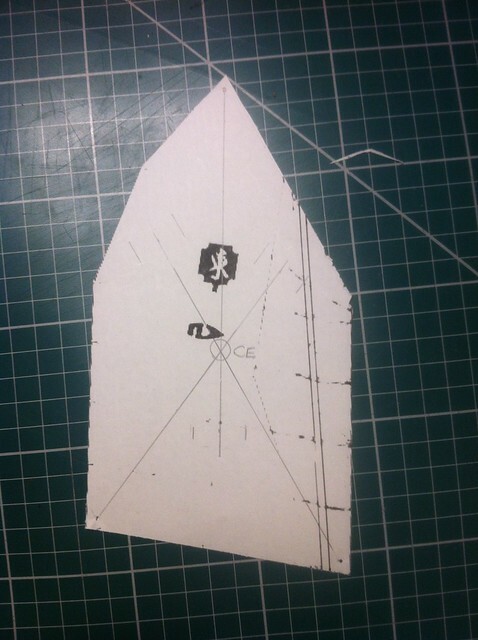 But I suspect there’s rather less than a meter, and there’ll be even less if I build a bigger sail. So for the moment I’ve just fitted a white strip for use when anchored and motoring. I lowered the mast and moused a four-core cable into both parts. (I left a loop of mousing string in the mast when I installed the conduit.) I cleaned the mast with meths then wrapped the LED strip around in place. 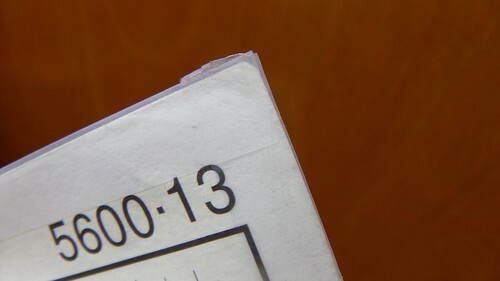 Then I gradually pulled the adhesive backing from under the strip and pressed it in place. I used a terminal block to connect the light for now, wrapped and secured with tape. That’ll do for testing. It looks pretty good and is certainly bright. The main problem with this arrangement is that I can see some of it from the cockpit. It may be too bright, but you can simply cut off sections of these strips so it is easily dimmed. 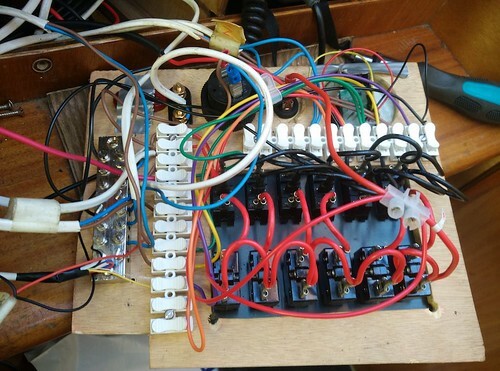 The next step of the plan is to wire up a little matrix using a multi-way rotary switch with positions for sailing, motoring, anchored, etc. That way I can combined my bow bicolour with the new masthead white to give others some idea of my heading when motoring. That will wait until the grand electrical panel rebuild. It’s a bit of a bird’s nest in there at the moment. I will let you know whether this works out in practice. 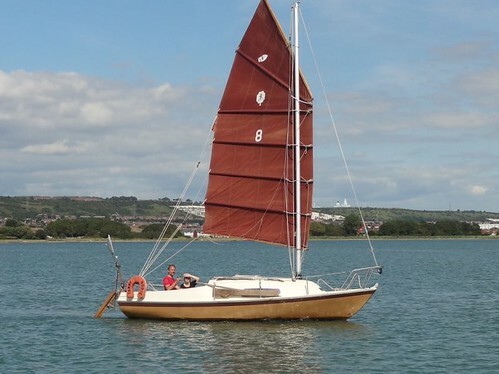 It will help the sail stay out in very light winds — particularly useful when becalmed. 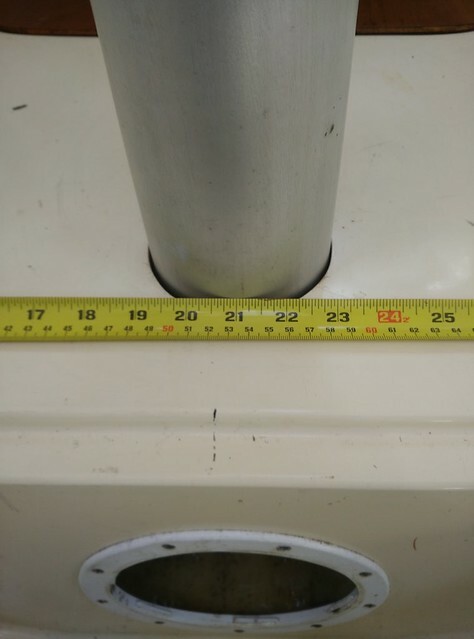 It will cause me to rebuild Tammy’s mast step, which is a known weak point. 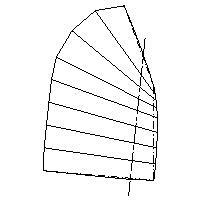 It will shift the centre of effort of the sail forward, improving the balance of the boat and reducing weather helm. I believe I can achieve about 5° forward rake by moving the mast step aft, pivoting the mast within the cone that forms the partners. arctan(10cm/118cm) = 4.8° I believe. 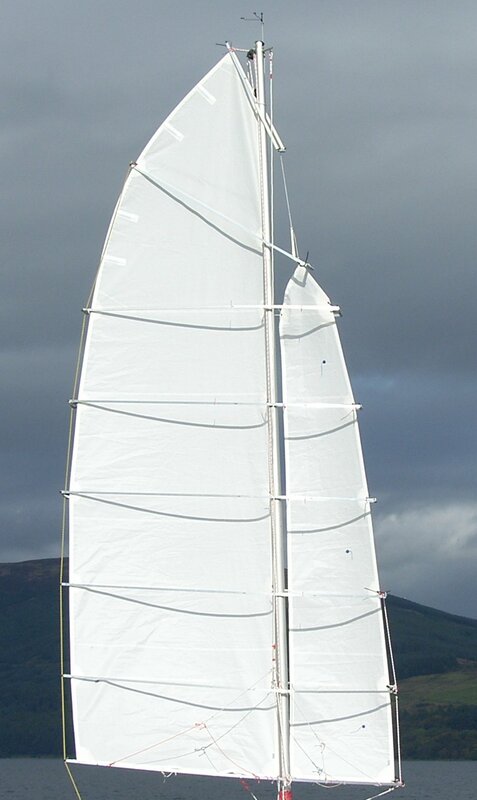 This should being the centre of effort of the sail (shown below) forward by about 3.5m × 10cm/118cm = 30cm. 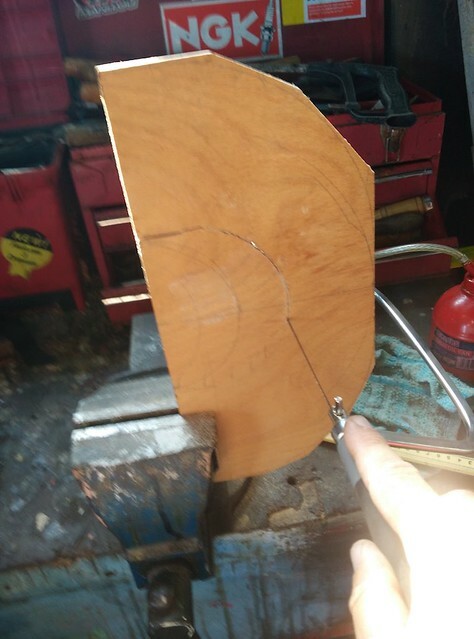 Because nobody has done this on a Coromandel and the future sail plan is unclear, I’ve come up with a scheme to make the rake adjustable. Firstly, here’s s picture of the existing step. I hope you can see why this is inadequate. It’s been replaced on every other Coromandel I’ve seen! 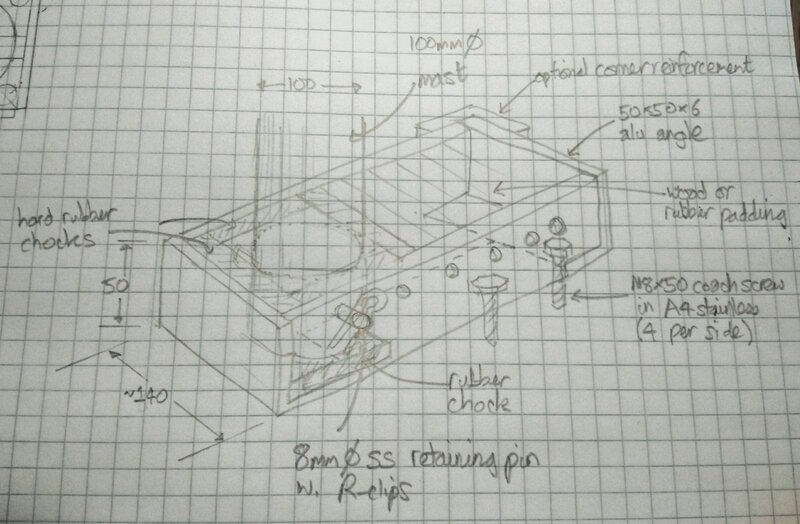 Here’s a drawing of the mast step that will make raking possible. I’m afraid I’m writing blog articles on my phone recently and so I don’t have my nice diagram software. You will have to make do with a photo of my pencil drawing. 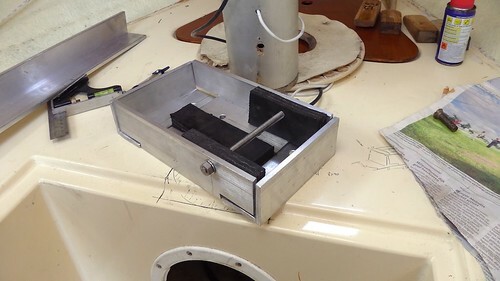 This is basically a rectangular box made of aluminium angle, into which the mast is wedged using hard rubber chocks, and further secured with a retaining pin (to stop the mast wandering or jumping out). 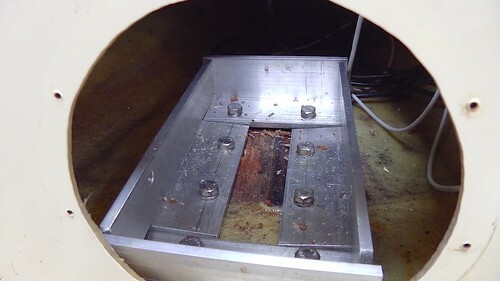 The box is screwed to the laminated wood block that’s already glassed into Tammy’s hull, using large coach screws (hex heads and wood threads). The mast base can be chocked and pinned at various positions in the box, allowing various angles of rake. Of course this means adjusting the blocks in the mast cone, so it’s not something to do at sea. I tried that (accidentally) once. 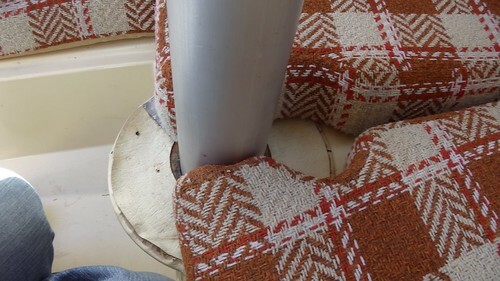 To allow for this I need to enlarge the hole in the berth that the mast passes through, making it into a round-ended slot. 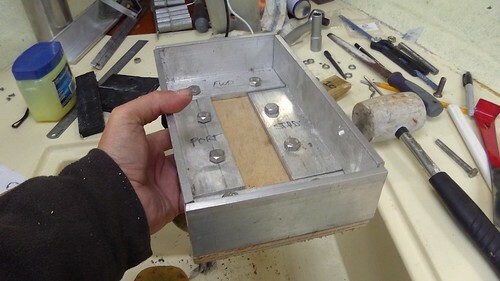 The box could be strengthened in various ways, but I already have 6mm gauge aluminium angle — double the gauge of the mast itself — so it ought to be fine. 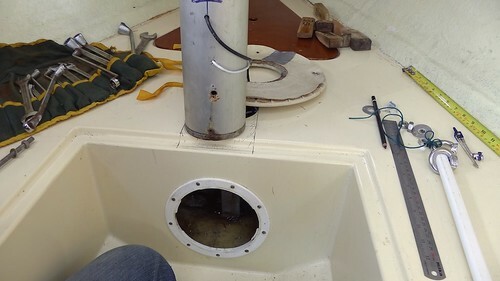 Incidentally, the reason that the angle turns inwards is that it’s very hard to get tool access to this area of the boat. 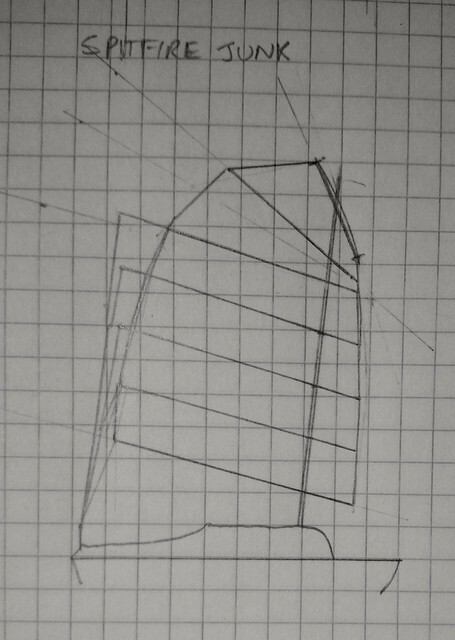 I don’t think I will be able to make pilot holes for the coach screws except through the slot for the mast. Having the screws inside also makes them possible to inspect through that same slot. I hope this will all become a lot clearer when I start doing the work and have some photographs. In the meantime, is be very interested in criticism or ideas for improvement.